At the 3rd session of my Basic Korean class yesterday, we learned about numbers. And since I already know about numbers in Mandarin, Cantonese, Fookien and Tagalog, I thought of making this table as a memory aid. Note: The Cantonese column uses Jyutping romanization. The Fookien column does not include tone information. First off, a bit of background: one of my goals is to learn Mandarin Chinese, Japanese, and Korean. Yes, all three. Yes, I know it’s kinda crazy. Anyway, as part of this goal, I originally planned to start learning basic Korean or Japanese as soon as I attained an advanced level in Mandarin Chinese. Actually, I will be re-taking Intermediate Level 6 (out of 6) at the Confucius Institute in Ateneo Professional Schools, Makati next week in order to further polish my skills before proceeding to the Advanced classes. So, not quite at the advanced level—yet. 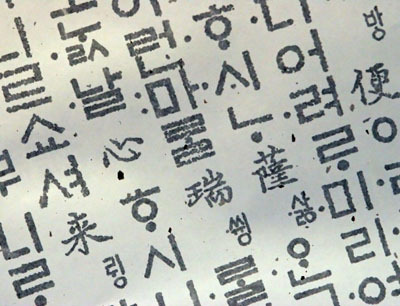 Regardless of which, I decided, against sanity and the advice of some people, to enroll in a Basic Korean class at the Korean Cultural Center in the Philippines. On the same day. Chinese in the morning and Korean in the afternoon. Saturday was the only schedule that was feasible for me due to my work schedule. I’m not yet sure if this would cause some linguistic confusion but I hypothesize that it would not due to the level disparity. Well, let’s see how it plays out. For now, let’s just focus on these two government-supported institutes. Having attended classes at the Confucius Institute for over a year now, I’ve noticed some differences in their approaches, which I’ll talk about in this post. This is not about which one is better; I’m simply contrasting them should you be interested in learning Chinese or Korean from these institutions. It’s inspiring how one person can collect and build such a great body of work at Guide to Japanese. Strangely enough, I found this blog when I was looking for a specific construction on Chinese. Wikis are immensely useful for collecting and organizing information on languages. The Korean Wiki Project is a great example. I looked for an equivalent for Chinese but haven’t found one yet. Professor O’s Learn Korean Videos are not only informative but also entertaining. I like the way she uses graphics and different characters to give examples of language use. I dove into the mass of pillows, blankets, rilakkuma plushies that made up my bed and was thinking about the lazy morning I would have that coming Saturday, when my cellphone rang. It was a friend and organizer of very popular KPop events in Manila. “Hey Niaw! The emcee won’t make it until the afternoon tomorrow! Can you take over as host in the morning of KPOP and Culture Fest?” Despite the short notice, I love hosting events, so I agreed. Arriving at the event the next morning, I met Jinsoo Choi, my co-host for the morning session. After finding out he’s Korean and wasn’t born in the Philippines, I was shocked by the ease with which he used colloquial Manila-flavored Tagalog, with slang expressions like “SABAW” interspersed into the fluid mix of Tagalog and English that is so characteristic of Manila’s inhabitants. Were it not for his name and distinctive appearance, you would not have known that he isn’t your typical native Manila student.